Wales' Chief Medical officer Dr Ruth Hussey says regulating food portions and the size of fizzy drinks could have a real impact on tackling rising obesity rates. She says forcing cafés and takeaways to detail calorie counts on menus could also help tackle the problem. So what do the Labour run Cardiff Council go and do? Introuce a "sports tax". For those who aren't aware sports teams have to rent the pitches they play on. This is called pitch fees. 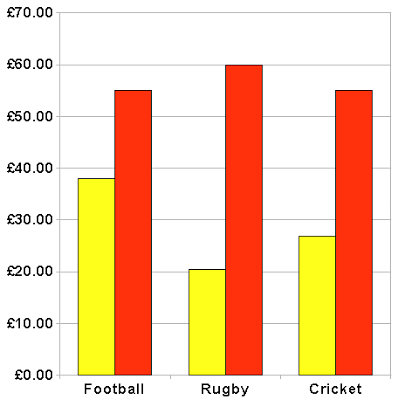 Cardiff Council wants to hike these fees up by the following amounts. If you graph those increases it looks like this, yellow is the current fee and red is the new fee. It will be interesting to see how many teams boycott this new 'tax' and how many move or stop playing. Whatever happens, at a time when obesity is at such crisis levels and the obvious knock on effect that has on the Welsh NHS, it does appear to be a very odd decision to penalise those who want to exercise. And let's not forget the (brace yourselves, buzz words are coming) 'Olympic legacy' that being an ' Olympic venue' is meant to offer. "Olympic legacy" = rising bollards in Westgate Street. 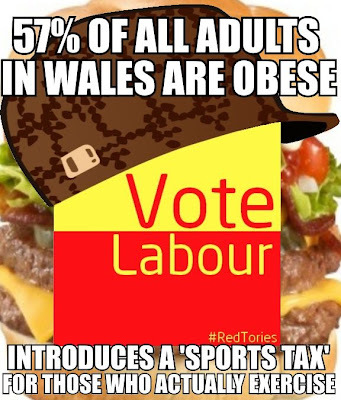 Labour councillors want the populance to be obese, so they can blame the London government in order to get votes. Bollards and bashing the Tories with fat people. Love it!